That's right, there's a free Amazon promo code doing the rounds today which will knock £5 off any eligible order of £25 or more as long as the item is supplied by Amazon EU. There are some T&Cs to consider, but nothing that should get in the way of most purchases. So as we've said, it has to be shipped by Amazon and no third-party or marketplace sellers ('fulfilled by Amazon' doesn't count either). Digital products, video game pre-orders, booze and gift cards are also excluded. Otherwise, you're pretty much good to go, just remember it expires at midnight tonight and can only be used once. So head on over to that wishlist and get some shopping done! Ideally, you want to use it on something that's already had a bit of a discount to maximise your savings. Usually, we'd be encouraging you to take a look at one of the Alexa smart speakers or Kindles, but they're all currently full-price. And seeing how often these items regularly get hefty discounts over £5 we think it's worth waiting for an even better deal. Keep an eye on our Amazon Echo deals and Kindle sale prices guide for the best offers. We've found plenty of already discounted items on our extensive roundups of the cheap laptop deals and TV deals, with plenty of options from Amazon included if you've been considering an upgrade of your old model. Why is Amazon giving us a free voucher? Nice of you to ask. Much like last year, Amazon is celebrating winning another Consumer Choice award after a nationwide survey named the company the UK's favourite retailer at the Retail Week Awards. Actually, this is the third year in a row it has won the accolade. 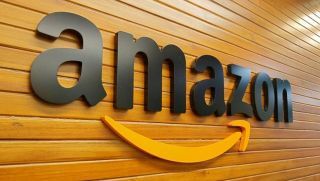 Retail Week's Managing Director, Chris Brook-Carter said: “Many of the reasons that put Amazon on the top spot in 2019 were the same that have made it a customer go-to since its launch. Speaking of Prime membership, if you've not signed up yet how about a free 30-day trial? You can enjoy super fast delivery and get stuck into Amazon's Instant Video library for a great selection of TV and movie content. Stick with the service and you can enjoy exclusive discounts in the Amazon Prime Day sales later this year too.